Marchionne says Alfa Romeo, Maserati spin offs not being considered. MILAN/DETROIT -- Fiat Chrysler Automobiles CEO Sergio Marchionne suggested that U.S. President-elect Donald Trump might support the idea of General Motors merging with his company. Marchionne said he could still do one more big deal in his career, alluding to efforts to merge Fiat Chrysler with another automaker. He previously has said that GM would be the best partner, and on Monday, he ventured that Trump might just appreciate such a marriage. 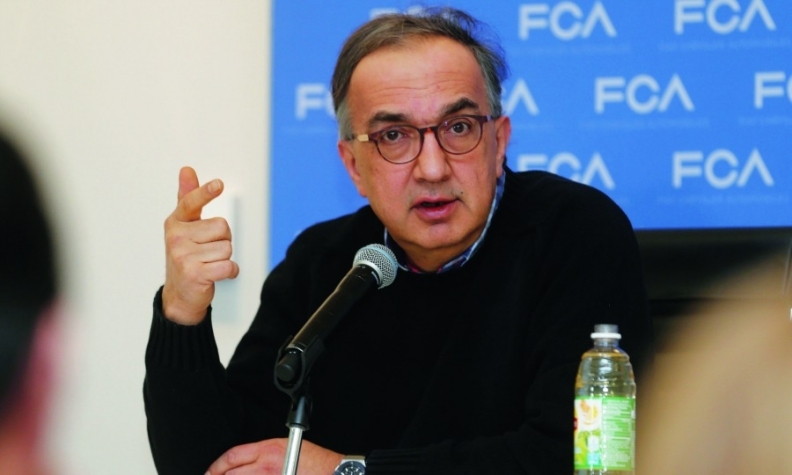 Marchionne later added that he's not currently pursuing any combination as he just focuses on reaching the carmaker's 2018 financial targets. "From what I understand, I believe that Trump should like a GM-Chrysler tie-up," Marchionne told reporters at the Detroit auto show. He said he has had no direct contact with Trump and declined to comment on policy matters before the Jan. 20 inauguration. Fiat Chrysler and other automakers are wasting 2 billion euros a week in capital that could be saved through consolidation, Marchionne reiterated. His company also has a high concentration of light trucks in its lineup, leaving it exposed to criticisms about fuel economy -- another reason why a tie-up with another automaker may be needed. GM CEO Mary Barra had no interest in merging with Fiat Chrysler when Marchionne suggested the idea in 2015. At the time, Barra said GM could post strong financial returns on its own. GM's position hasn't changed, said Tony Cervone, a spokesman. "We take the same position now that we did back then," he said. Trump on Monday praised Fiat Chrysler's announcement a day earlier to invest $1 billion in Michigan and Ohio factories, adding 2,000 jobs and the ability to make three Jeep models and heavy-duty Ram trucks currently made in Mexico. Those investments were already in the works and weren't made to avoid criticism from the president-elect, Marchionne said. Trump has posted on Twitter threatening Ford Motor, Toyota Motor Corp. and GM with a tax on imports from Mexico. Fiat Chrysler's decision to build the new Compass in Mexico was made in 2014 and won't be changed, the CEO said. The compact SUV will also be exported to Europe. Jeep's expansion plan could be affected by trade barriers, Marchionne said. "Marchionne was vocal on the ideal merger partner," said Mediobanca analyst Massimo Vecchio, who raised his recommendation on Fiat Chrysler to outperform from neutral on Jan. 5 with a note titled "Trumpmania." "We see some chances that Trump's unconventional approach would favor a national champion," Vecchio said. Marchionne later dismissed speculations he's still actively looking for a combination. "Nobody wanted to dance, the music stopped," he told reporters. "We got other things to do” and we want to stick to our plan, he added. Fiat shares rose as much as 3.6 percent in Milan to the highest since April 2015, giving the company a market valuation of 15.3 billion euros ($16.2 billion). The shares have surged more than 75 percent since the beginning of the fourth quarter, in part on speculation that Trump might temper some of the fuel-economy standards in the U.S.
Marchionnne, who said he has no "bad news" on 2016 results, said the company's Magneti Marelli component unit is not essential for the carmaker and could be spun-off after 2018. He said a separation of Maserati and Alfa Romeo is not in the works. Investors are no longer seeing his 2018 targets as a "fantasyland," the executive said. The company is working to meet its 2018 goals and aims to reach 5 billion euros in net cash, improving from a negative position today. Part of the goal is eliminating debt. "We are the only indebted carmaker," he said. "I want to get rid of debt as soon as possible." He reiterated the carmaker's top priority is reaching 2018 financial targets. Marchionne said he may not need to wait for 2018 results to pay the company's first dividend. "Why not before?" he asked rhetorically. "Let's see how we close 2017."